Editor's Note: Ed Stafford, 34, from Leicestershire, central England, has been walking the length of the Amazon River since April 2, 2008, to raise awareness of the region. He began his trek at the source of the river in Peru, encountering pit vipers, electric eels, anaconda, mosquitoes and scorpions. He was joined in July 2008 by Gadiel "Cho" Sanchez Rivera. The pair are due to reach the shores of the Atlantic on August 9. During his trek Ed has blogged using a laptop and a satellite Internet link. 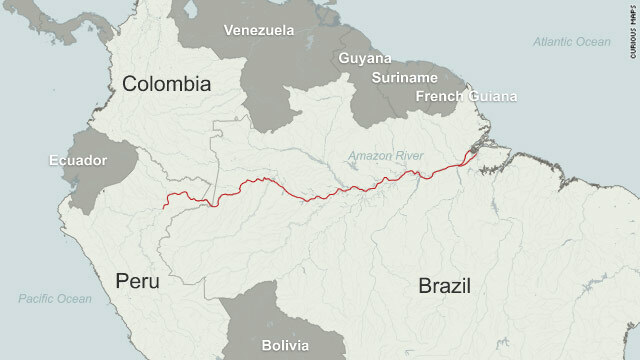 You can follow his journey on the Walking the Amazon website. In his fourth piece for CNN he describes how they have walked for up to 14 hours each day and how they were buoyed by the arrival of expedition photographer Keith Ducatel. (CNN) -- We're definitely on the home straight, but things aren't easy due mainly to lack of sleep and the miles that we still have to walk by our self-imposed deadline of Monday 9th. We've booked our flights home for the 10th, so we need to arrive at the Atlantic Ocean by the 9th! Cho and I aren't getting very much sleep, but we're in good spirits, buoyed by the arrival the other day of Keith Ducatel our expedition photographer. Keith first joined us in August 2008 on the Peruvian leg. Keith's images of Cho and I slogging through the jungle, setting up camp, cooking our meals and walking have helped make our website and blog come to life. His images have drawn in visitors from around the world and we're indebted to Keith for his commitment to the expedition and for helping it come to life in the early days. The last few days have been an endurance epic; today we started at 7am and finally arrived at our destination of Porto do Arapari at 10pm. After grabbing something to eat, and replying to emails I finally got my head down at 1:27am. We've never walked 55km in a day before so we are satisfied with what we've achieved, if a little stiff. This mileage is mammoth in relation to when I think back to days in thick jungle where we barely made a kilometer. Cho and I would take turns with the machete and cut our way through, doing our best to stay vigilant and on the look out for wasps nests on the underside of huge leaves and pit vipers coiled up on the forest floor. And although things have been hard, difficult and dangerous at times, we know how privileged we are to have spent these two years in arguably the most important place on our planet. A place that is changing day by day at a frightening pace. I'm committed now to this place for the rest of my life and I intend to take 'Walking The Amazon' around the world and keep alive the stories of the people we've met along the way, the lives in the Amazon and the tale of the jungle. We know that we have captured a video snap shot of a place that is changing faster than many of us can comprehend. We're on the doorstep of Belem now, a big city with sky scrapers which is different after all the months in the jungle and walking down logging tracks. Cho and I are going to get our heads down and dream of the finish line.